Adaptive re-use of obsolete small-cap commercial structures tends to be least risky when space demand is robust, opportunistic capital is flowing - and strong fundamentals help overcome the pesky delays that tend to plague repurposings of vintage properties. But one contrarian factor can also help projects pencil out even amid tough times for creative real estate investors: attractive pricing. Indeed while use-change projects remain somewhat rare amid the sputtering economic recovery, American cities certainly hold no shortage of idled commercial structures that are just no longer competitive in their locations as currently configured. And while underlying real estate economics are logically pushing many if not most small-scale repurposing ventures toward residential rentals (we’ll mention several new projects below), we’re also seeing a few investments targeting more marketable business space. As we’ll see with the conversion of a vacated Chicago meatpacking plant to a mix of retail, office and residential space, a favorable price is a key hurdle for visionary entrepreneurs. But perhaps more importantly, the existing structure and site not only need to work for the more appropriate new use - but the additional costs of designing and executing the conversion mustn’t be prohibitive. Accordingly with an older structure in particular, it’s critical to accurately calculate costs of converting to more appropriate uses - along with the effective rents the repurposed property should command, stressed veteran Chicago broker and investor Scott Maesel. And the Sperry Van Ness managing director is in pretty solid position to assess such prospects, having brokered several recent trades of properties now being repurposed - including the former meatpacking plant he and his partners are converting to three uses on as many floors. “One of the main challenges in an adaptive re-use venture is that you won’t really know what you’re dealing with until you get in and pull back the walls,” Maesel relates. With structures built as specialized single-purpose facilities, converting to modern uses is also likely to entail some systems upgrades. Even if HVAC, electrical, plumbing systems and the like have been modernized reasonably over the decades, chances are more intense uses will entail expenditures to comply with life-safety codes (sprinklering, fire exits, etc.) as well as ADA particulars (wheelchair access, etc. ), Maesel adds. And that’s pretty much what he and his co-venturers are up against in repurposing the 7,200-square-foot former Joseph Baumgartner Co. meatpacking facility along an increasingly popular shopping, dining and cultural stretch of West Randolph Street in Chicago’s Near West/West Loop district. While negotiating a down-market purchase price of $725,000 (easy math: $100 a foot), Maesel and partners found a great ground-floor anchor in the growing Floyd’s 99 chain of self-styled “original rock & roll barbershops.” Floyd’s agreed to pay $33.50 a foot on a net basis. The ground floor of the timber-and-beam structure - originally dating to the 1920s - had housed Baumgartner’s administrative operations along with a massive meat cooler. Offices make sense for the second floor, which had likewise housed mostly meat cooling facilities, Maesel noted. He and partners are asking $20 a foot for this space on a modified gross basis. And as the area has also become such a high-vitality urban locale, the partners are converting the third-floor’s former storage space into a three-bedroom residence - where Maesel expects his recently augmented family (they had twins earlier this year) will live. Logically the developers helped lure the primary tenant by agreeing to erect an attractive façade befitting Floyd’s image and clientele. And as the ongoing transformation of the 935 W. Randolph St. structure likewise illustrates, new uses often require other architectural upgrades such as windows bringing natural light into residential and office space. Still Maesel and company aim to keep additional hard renovation expenditures, beyond the purchase price, below the $500,000 mark. They were able to finance some of the acquisition and repurposing expenses with debt from private capital sources. And they plan to secure a permanent mortgage once the second-floor offices are leased and income stabilized. No doubt it will help to have a nation-spanning credit tenant like Floyd’s anchoring the tenant roster for an initial 10-year commitment, Maesel stresses. 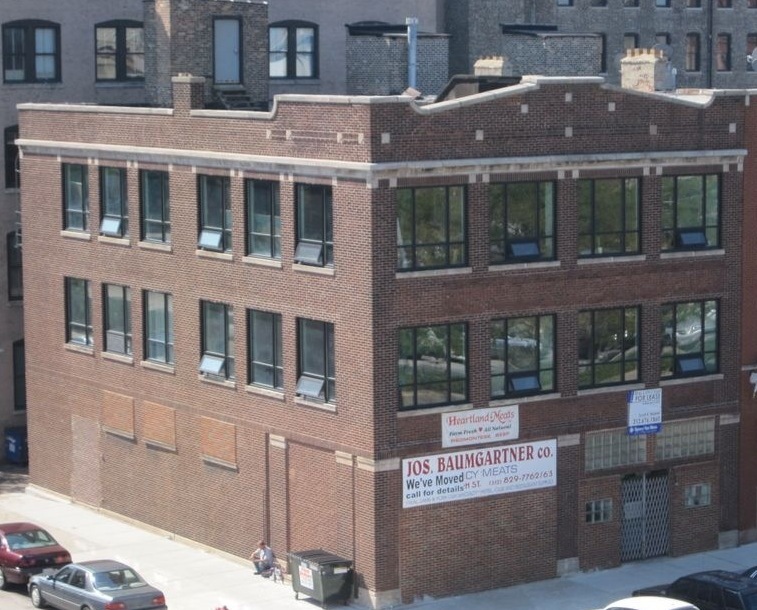 A few blocks further west along Randolph, Maesel helped a client sell another former meatpacking plant to a principal of the SRAM bicycle components operation for $1.1 million. The long-vacant 14,700-foot single-story bow-truss structure known as the Weinstein Meatpacking Building dates to the 1950s. The interior is mostly comprised of freezer/cooler space, and the charitably minded new owner plans to pretty much demolish the improvements and use the facility to refurbish bikes and host events. Meanwhile, a few intriguing ventures around the country reflect conversions of small commercial and special-purpose structures into much-needed rental housing. In Chicagoland’s western suburbs, Tinley Park single-family investment specialist Mack Cos. just bought a four-story former shoe factory and adjacent acreage on Central Avenue in Cicero from former lender Old National Bancorp for $1.2 million and plans to repurpose it into 21 residential units. In Wichita developers Dave Burk, Mark Isley and partners are repurposing the former Player Piano Co. headquarters structure along the Old Town district’s E. Douglas Avenue into 36 residential units. The cost of converting the century-old five-story structure is projected at about $4.1 million, with rental rates pegged at $1.15 per foot. Meanwhile Buffalo developer Nick Sinatra is transforming much of the quartet of century-old, mostly vacant downtown buildings he recently acquired into 30-plus apartments as well as street-level retail space. Sinatra purchased the properties on Main and Ferry streets for $1.15 million, and will invest a like amount into the repurposing efforts.